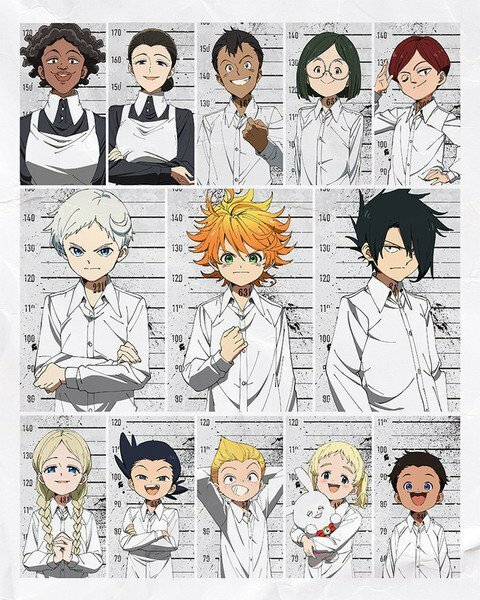 The Promised Neverland. Now that this much-anticipated series has begun streaming, has it lived up to the hype? We’ll only be getting twelve episodes, it seems, so our writers are here to share their thoughts on this and some of the other new shows making their debut this winter. And then there are the much heralded returning series – for who could ignore Mob Psycho 100 Season 2? But…am I getting jaded… or are there rather too many isekai titles? And so many series with casts of four/five/even six cute girls – have we reached peak girl and achieved moe overload? We’re sharing our thoughts – but we’re always keen to know what you think too. Have we picked some winners? Or have we missed a potential stand-out? Let us know. I’ve only gotten around to watch one series for Winter this year, and that is Dororo, which is currently simulcasting every Monday on Amazon Prime. I’m going to be completely honest; I had no idea what this series was about going in; all I knew was that it looked interesting from the few stills I’d seen and it was positively received when the first episode launched. I had no idea that it was based upon a late 60s manga by the ‘godfather of manga’ himself, Osamu Tezuka (known for Astro Boy, Princess Knight and Kimba the White Lion) and that this was in fact the second anime adaption, the first being released as a 26-episode series in 1969. So, my views are based upon the first few episodes going in completely blind, and so far, I’m enjoying this. The story is very interesting and the tone it sets from the beginning really sells it as a darker Japanese fable. Whilst there is gore and the image of a skinless child is in itself terrifying, it’s not portrayed in a gratuitous manner (unlike some other dark fantasy that debuted last year) but to draw the audience into its world and portray its cruelty without going too overboard with the edginess or shock value. The plot so far is going for a monster-of-the-week type of pacing but watching the balance of power shift from Daigo to Hyakkimaru over time is fascinating and I look forward to see where it goes. 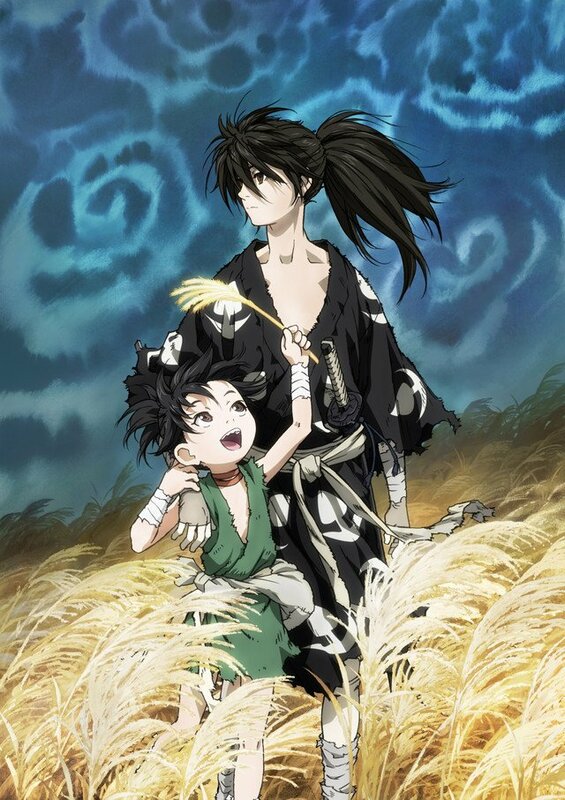 Although I must confess that I have no idea why the series is called Dororo; yes, he’s the audience’s point-of-view character and his ability to communicate is vital, but it’s primarily Hyakkimaru’s story. Despite being based on a late-60s manga, the visual style looks more in line with something you’ll find in early 2000s and its violence factor something from the late 90s, which is an interesting take since those decades fall nearly in the middle between the original manga’s release and this anime’s premiere. If you’re a fan of the original, you’ll also notice that Hyakkimaru has gone through a radical redesign; more gender neutral and slender rather than the overly male and muscular design he was originally given. The new look allows to visually express the more mysterious yet vulnerable sides of the lead, which works since he’s fierce in nature but his blindness and muteness make him helpless in other aspects of life outside of combat. While doing research on the series for this article, I learned that the original manga was cancelled with no ending and the original anime also ended abruptly, so it’ll be interesting to see if the 2019 can provide us with a new, conclusive ending for long-term fans and new ones alike. This year’s Winter season seems remarkably quiet compared to the large mass of shows we’ve had over the past six months or so. Each season I go through the list of airing anime and build my own list of ones to watch, and even though it’s still pretty sizable (I tend to watch everything I can), there’s a lot less on it than usual. I do however have a few good picks that I’d heartily recommend looking into. First up is this season’s music show: the second season of BanG Dream!. The first aired a couple of years ago now, but its story has kept on going through the mobile game Girls Band Party! which opened up after the anime had finished in Japan and came out in English-speaking territories last year. If you’ve been playing the game, jumping in here feels very much a natural extension – the first episode spends most of its runtime introducing all of the different bands from the game that never appeared in the anime’s first season – and you’ll immediately feel at home with the characters you love, no matter which band is your favourite. For newcomers it’s perfectly possible to jump in here as this is an entirely new story and doesn’t really hark back to the first season, but be aware that you may feel a bit lost at first as you won’t have the investment in the central characters of Poppin’ Party. You’ll therefore miss out on the finer details of the existing character relationships, but all you really need to understand is that this group of friends made a band and now they want to start performing regular live shows in their town’s indie venues and reach the level of some of the existing girl bands that they look up to. While the first season had Glitter*Green as the big band, Season 2 switches focus to Roselia, who are arguably the most popular among fans of the series and fall more under the hard rock side of things – for an example of a similar band you may have heard of, look at BAND-MAID: harder and rockier than SCANDAL, but not really dipping into full-on metal or the BABYMETAL style idolcore stuff. I do think it’s good that they’ve taken their popularity into account as they really get the most playtime in the first few opening episodes. While Roselia are the highlight, the music by each band is pretty good overall and there’s plenty to get your teeth stuck into. We’ve definitely come quite a way from those terrible renditions of “Twinkle Twinkle Little Star” in Season 1. Visually, it might take some getting used to as all the characters are rendered in 3D CG, and I think it doesn’t look as natural as it would in 2D, but it’s not too bad and keeps things consistent so you aren’t jumping between 2D and 3D when moving into the performance sequences. It’s not that visually stunning, but it does avoid something that can be jarring in other music and idol shows. So far, I’m enjoying it though, and I’m looking forward to seeing how the story moves forward and finding out if Poppin’ Party can make it as an indie girl band. My next pick is Boogiepop and Others, an adaptation of Kouhei Kadono’s Boogiepop light novel series. While the name may not ring any bells for newer anime fans, older folks may notice the title from Boogiepop Phantom, an anime-only follow-up to the first light novel that aired in Japan in 2000. While I’ve never watched it, it was something I was vaguely aware of when I started getting into anime in the mid-2000s as one of the more popular shows at the time. Jumping into this then, my expectations were pretty high and, after watching the first three episodes, I actually really like it. It’s a mystery-horror show that revolves around Boogiepop, a mysterious entity who appears as a separate personality of Shinyo Academy student Touka Miyashita. When her boyfriend, Keiji Takeda, notices her getting involved in a weird incident in town, he confronts her about it, only to be dragged into Boogiepop’s mysterious world view where she protects the planet against supernatural beings. What I find really interesting about this show is the way it goes about telling its story, as the first three episodes recount the same events, but each time from a different character’s perspective. At first, looking through Keiji’s eyes, we only really see half the story, as students begin to go missing in mysterious circumstances and he begins to investigate, frequently conversing with Boogiepop about the state of affairs. 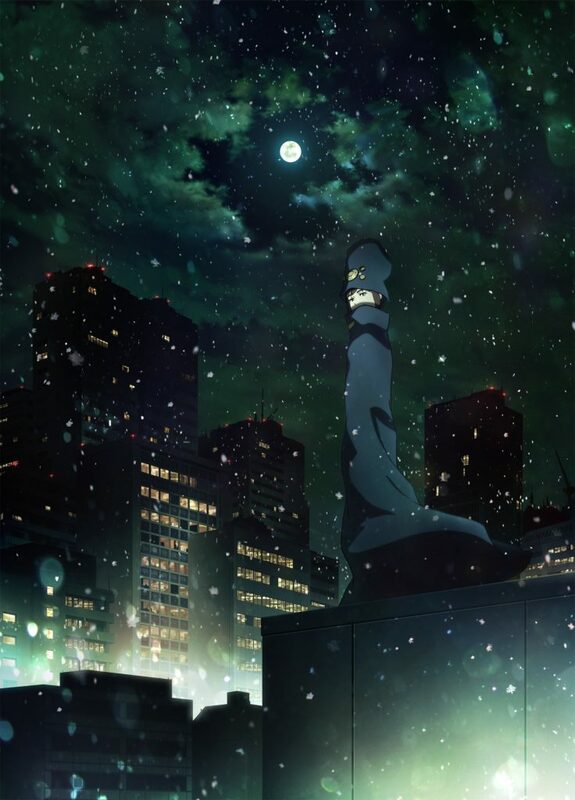 Just when he thinks he’s close to solving things, Boogiepop suddenly tells him that everything is resolved; and as a viewer you think you know what’s been going on – but the subsequent episodes reveal that there’s a lot more going on than you thought and you get to appreciate the story from a different angle. While this wraps up one arc, I’m interested to see if they continue this kind of thing as it’s a fascinating plot mechanism to use, but I worry it’s going to get old pretty quickly. For bringing you into the series, though, it works really well. Visually this is not one of the better looking shows this season, and although the drab tone suits the story, there really isn’t anything exceptional here. In fact, it’s rather boring to look at; which is a surprise with this coming from Madhouse, one of the mainstays of Japanese animation. If you’re invested in the story and what’s going on, you’ll still enjoy it, but if you’re looking for a visual masterpiece then you’ll have to look elsewhere. It’s a shame that they couldn’t put more effort into even the opening, because the opening song, Shadowgraph by MYTH & ROID, really fits the overall tone of the show and has wormed its way into my head of late. Perhaps one for older fans then, but it’s still worth checking out to experience in some form one of the major light novels of the turn of the century. My third pick is the somewhat lighter and refreshingly ridiculous Kaguya-sama: Love is War. This is a romantic comedy series about a student council president Miyuki Shirogane and vice-president Kaguya Shinomiya who are both in love with each other but refuse to be the first to confess their feelings as whoever does will be the loser and be forever after dominated by the other. There are three elements that make this show really work. Miyuki and Kaguya are a great combination when put together, playing their friendship and relationship like a game of chess and trying to outwit each other on the most mundane of things, from being offered a pair of cinema tickets or bringing lunch in from home. Each scenario generally flies by over five minutes or so and are pretty funny throughout – even more so when their friend Chika Fujiwara gets involved and they have someone else to bounce off. The fact that she’s clueless as to her friends’ feelings for each other makes the pair’s awkwardness around each other more obvious when Chika is thinking completely innocently. Her character very much employs the “straight man” mechanic as she does a lot of the work of actually setting up the joke for Miyuki and Kaguya to respond to. Lastly you have the narrator, voiced by Yutaka Aoyama, who has such a great delivery that even the exposition is funny. While he’s mainly there to provide that background explanation, he also gets plenty of time to punctuate some of the jokes to aid the audience along. One of the issues that these 5-minute gag comedies have is making sure that they manage the time for the joke correctly. I’ve found that if there’s not enough time, I miss the point of it and if it’s too long then it struggles to maintain the humour for the entire running time. For a full 25-minute episode there has to be enough content to fill it and so far there’s enough content and it’s well paced enough to carry the episode forward. Taking a quick look at the manga, it looks like there’s plenty of material to adapt so it should be able to keep going at this pace for the entire series. Just from this one episode, though, I am really into what they are trying to do and I’m looking forward to keep watching this week-on-week. Finally, I can’t really end this preview without mentioning The Promised Neverland. From the amount of people I know following the manga, I knew this was “The Big One” of the season and it certainly did not disappoint. While the setup of having this group of kids in an orphanage seems fairly innocent on the surface, there’s a load of techniques employed to give you that sense of foreboding that something just isn’t quite right here. From the numbers on the kids’ necks, not receiving mail from previous occupants, the low fence in the woods that any of them could climb over despite being told not to… It’s just really good at building this particular atmosphere. And then when the big moment hits, it really makes an impact with a shocking reveal about the world these kids live in. As the series is animated by CloverWorks, I had my reservations as to whether they could do such a talked-about title justice, but it turned out that this was the best opening episode of everything I’m watching this season and honestly felt more like a climactic episode in the middle of the series. I guess my worry going forward is that they won’t be able to match the same level of tension and apprehension throughout the series; from what I hear of the manga, though, it does a good job of being a thrilling ride throughout so I’m hoping that is the same with the anime. On a more personal note, it’s also nice to hear my favourite voice actress, Sumire Morohoshi, getting the main part of Emma; her fun, cutesy voice is pretty much unmistakable at this point, and although I guess it kind of typecasts her, she does a really good job at voicing younger, more childlike characters. 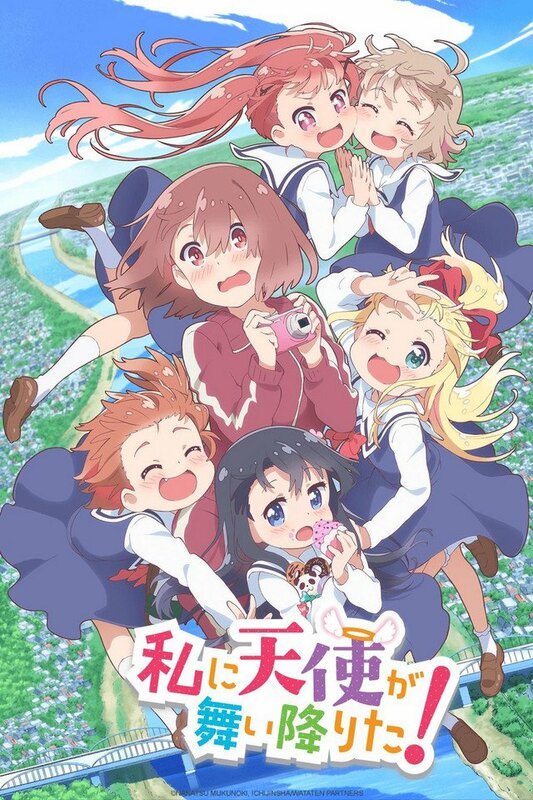 With the main characters all being children there’s a strong female cast for this one and it’s a good showcase for talents like Maaya Uchida and Mariya Ise. If there’s one anime you need to be watching this season then, it’s The Promised Neverland. Whether this will be the next big anime hit like Attack on Titan or Sword Art Online is something that only time will tell; but going off its first episode it really has me sold. If you’d like to watch any of these recommendations yourself, The Promised Neverland, Boogiepop and Others and Kaguya-sama: Love is War are all airing on Crunchyroll; while BanG Dream! 2nd Season is airing on HIDIVE. 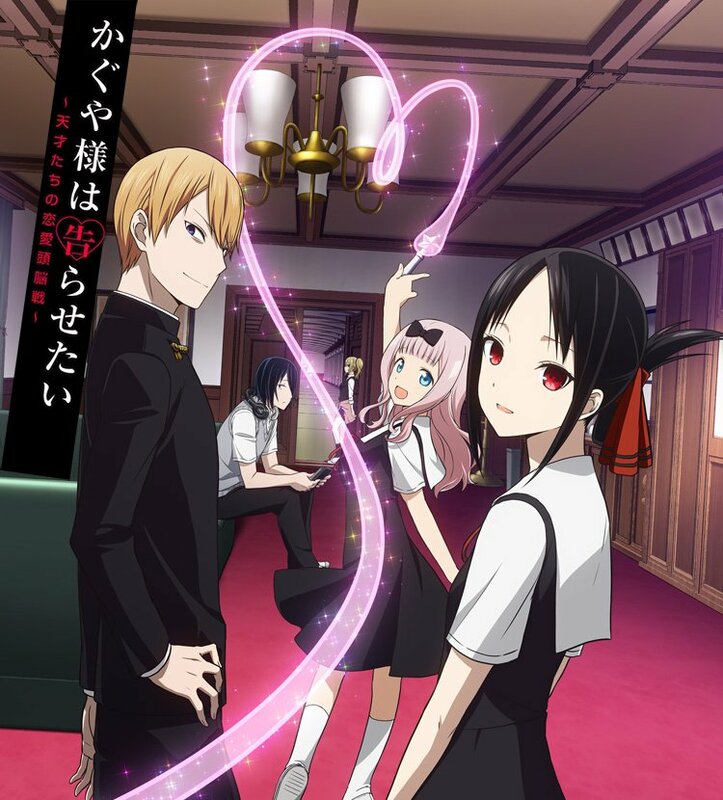 Like Onosume, I too have found myself captivated by the bizarre yet brilliant romantic comedy Kaguya-sama: Love is War, and am more willing than the series’ protagonist to proclaim my affections! On paper, dedicating a third of an episode to Kaguya wanting Miyuki’s LINE messaging app address sounds like a recipe for boredom, yet the series makes even the mundane a rapture of laughter with the quick-fire mental interplay between the lead characters, and its delightfully over-the-top delivery. Despite its absurdity, the premise also rings true to an extent. When someone builds up the courage to confess, their crush gains an inadvertent upper hand, with their response dictating whether an admirer experiences the euphoria of reciprocation, or the despair of rejection. Kaguya and Miyuki’s social statuses add an extra layer of intrigue to this game of mental chess, with submission being an appalling thought for a conglomerate’s heir! What does concern me however, is whether the series can keep my interest until the season’s end. Three episodes have currently broadcast, with the second opening with the same five-minute explanation of the premise, which was then sped up for attempted comedic effect in the third. It may be a quirky attempt from A-1 Pictures to mimic the more avant-garde style of SHAFT, where director Mamoru Hatakeyama has previous experience on the likes of Puella Magi Madoka Magica, but I am worried that it exists for the more practical purpose of filling time at such an early stage in the show’s life. The SHAFT influence does show up more positively elsewhere however, like the trippy opening animation! Speaking of the animation, Kaguya-sama: Love is War looks gorgeous with a palette of bold deep reds and blacks, creating a striking contrast making our lead heroine instantly recognisable. The third episode’s ending theme also deserves particular praise for its use of rotoscoping in a dance sequence featuring council secretary Chika, who comes off as an airhead, but has surprisingly grim hobbies! This new season has brought a number of titles that have made me wonder whether we can enjoy a work despite its problematic elements, and that’s before we even consider the discourse surrounding The Rising of the Shield Hero. The anime that sent me down this train of thought, was in fact the comedy WATATEN: an Angel Flew Down to Me. SSSS.Gridman‘s Reina Ueda stars as Miyako Hoshino, a shy and reclusive college student who makes cosplay outfits in her spare time but doesn’t wear them. Instead, Miyako’s hobby is taking photos of her elementary school-aged sister and her friends, adorning them in everything from nurse uniforms to magical girl dresses. If the series doesn’t already sound sketchy enough, Miyako has a particular attraction to the pint-sized Hana, with her first reaction to meeting the child unfortunately, being best described as love at first sight (the Wikipedia article for the original manga even lists it as a “yuri” series… yeah). In the three episodes broadcast so far, I’ve felt genuinely uncomfortable on a couple of occasions. The only thing stopping me from slating the show entirely however, is that despite its repulsive main character, it’s actually really funny? The characters are wonderfully cast with actors who bring a fun energy to their roles. I previously mentioned Reina Ueda, but Rika Nagae (Asobi Asobase‘s Olivia) also brings a delightful excitement to Miyako’s younger sister Hinata, while Akira Kito (Uma Musume Pretty Derby brings a believable cuteness to Noa’s childish arrogance. The series is self-aware of how creepy Miyako is, but it’s when the series veers away from that territory that its comedic timing imbues the series with hilarious life. It’s just a shame that the series revolves around a young woman who’s portrayed as having an unwholesome interest in younger girls… whether I can look past that and enjoy what would otherwise be a sweet slice of life as the season goes on, only time will tell. 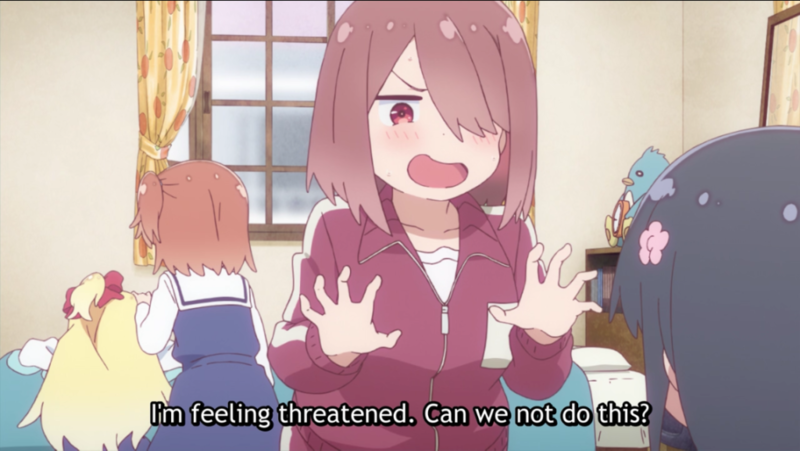 Both Kaguya-sama: Love is War and WATATEN! an Angel Flew Down to Me are available for streaming on Crunchyroll. Like last year, it seems as if the Winter season is destined to be one of the strongest anime seasons this year. There’s a lot to choose from and something to fit everyone’s tastes, but ultimately a good number of ‘must see’ titles hitting our screens. 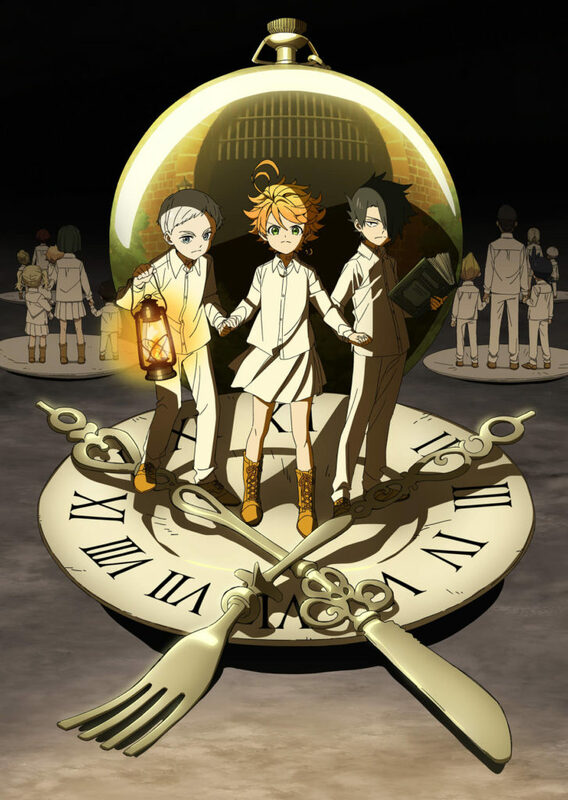 As Onosume already mentioned, one of the biggest series right now is The Promised Neverland. I’ve been following the manga since it started in the English Weekly Shonen Jump and it’s one of my favourites among the titles that currently run on the service. Although 12 episodes is not nearly enough to adapt all of the content, I’m confident that it will get us through the first thrilling arc and then hopefully prove popular enough for a second season. I was worried to begin with that animation studio CloverWorks wouldn’t be able to capture what makes The Promised Neverland special. The artwork for the manga is so well drawn and captivating that I was concerned the studio would have trouble recreating it, but thankfully my fears have so far proven unfounded. The story still holds as much weight as it did back when I first started reading the manga and I find myself eagerly awaiting each episode of the anime to experience the twists and turns to come anew. Plus it’s great fun watching how newcomers to the franchise react. Also I want to quickly mention how nice it is to have a popular shonen series with a female character in the lead role. Anime has been getting a lot better about this lately, but for a series that runs in Weekly Jump I still find it difficult to find likeable female protagonists and this is even more of a problem outside of slice of life series. Emma is cute, cheerful and a little clumsy; but she’s also intelligent and brave. She’s a great role model to the younger viewers among us and I hope that fans of The Promised Neverland on a whole appreciate her as much as I do. My second pick for the season is Domestic Girlfriend, a series I discussed in our review of 2018 manga and light novel article. When I wrote my piece for that article I talked about how the series wasn’t something I could consider a good manga, but it was entertaining and I think its anime adaption can be described the same way. Protagonist Natsuo Fujii spends his high-school days quietly, writing a novel and trying to gain the attention of his teacher, Hina, on whom he has a crush. One day he’s invited to a mixer by his friends and there he meets a girl named Rui who asks him to sneak out and go home with her. Ultimately Natsuo sleeps with Rui and the two think they’ll never meet again, but later that day Natsuo’s father reveals that he’s been dating someone and is inviting her over to meet Natsuo. Having lost his mother some years back, Natsuo is happy that his dad has found love again but his life is about to become extremely complicated when his father’s new lover turns up with Rui and Hina! With his son’s approval, Natsuo’s father chooses to marry his girlfriend, but now Natsuo has gained two step-sisters and has to muddle through his feelings toward them. While Domestic Girlfriend is playing with quite a few ‘taboo’ tropes, I like how it goes about things. Although it’s presented as a serious, dramatic series there is actually quite a lot of comedy dotted in throughout the story which helps give the characters a real likability they might not otherwise have had. It’s also easy to sympathise with Natsuo as it’s not easy to suddenly have the girl you slept with and the girl you have a crush on become your family – especially not as a teenager! Ultimately the fact that the love interests are family will turn some viewers off the show and that’s okay, I wouldn’t blame them for it. This isn’t the kind of set-up I’d usually find myself enjoying either, but Domestic Girlfriend is almost like a soap opera. It’s impossible to look away from and I find myself looking forward to seeing what happens next. It’s not for everyone but I do think it’s worth giving at least the first episode a watch before writing it off. 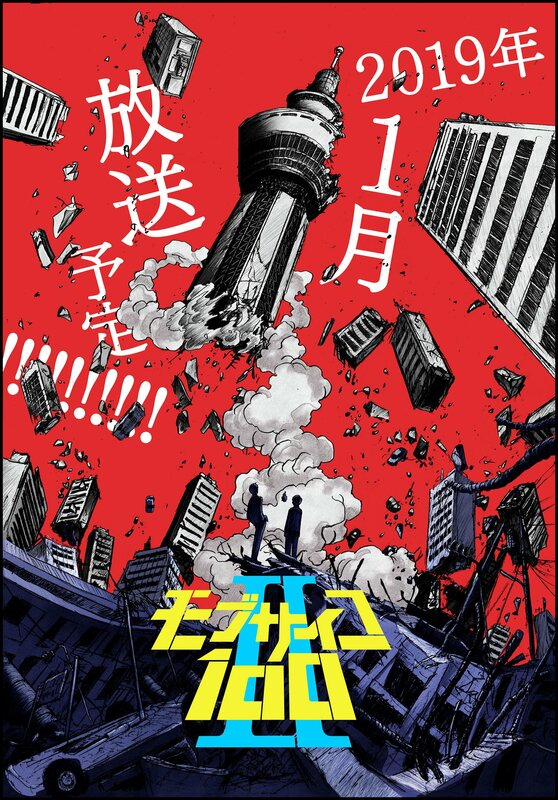 It’s probably also worth mentioning that for fans of the manga like me, it seems that this anime adaptation might skip some of the manga’s content. I say this because there is a female character in the Opening Song who doesn’t come into the manga for quite awhile, so I suspect they will either rush through or skip some content to introduce her. Alternatively maybe the studio, Diomedéa will do something original to the anime – much like when they adapted the Fuuka manga. Either way I’m intrigued to see how they’re going to adapt Domestic Girlfriend going forward! Domestic Girlfriend is streaming on HIDIVE, while The Promised Neverland can be found on both HIDIVE and Crunchyroll. Mob Psycho 100 is an odd series… literally, it’s full of very surreal imagery and concepts, but at its heart it tells the story of a quiet, insecure boy who is trying to become more social and out-going, and who just happens to have extremely strong psychic abilities. Now, the last thing this series should be called is a serious action show, though it has to be said that scenes of Mob using his powers are often among the best animated scenes going today; what it is, though, is legitimately funny. Mob has been manipulated by a man named Reigen, who has set up a spirit-busting agency despite not having any actual powers. Reigen was just conning people until he found Mob and was shocked to discover that the boy actually has the power to defeat ghosts. Mob is under the impression his Master is just testing him whenever he has to defeat an actual deadly spirit instead of his all powerful mentor. It sounds like Reigen is a bit of a git, but despite making a living as a con artist, he does actually legitimately care about Mob, and their relationship is one of the key highlights of the series. A few episodes into Mob Psycho 100 II and there’s been a very touching episode in which Mob has a girlfriend, though sort of doesn’t… it does have a legitimately heart-warming ending though. We also got a properly funny episode where Mob, Reigen and “Dimple” (a formally bad spirit that has become attached to Mob, eventually becoming an ally) go in search of Urban Legends and find some that are fake, and some rather more real than they’d expected. Mob is still an extremely easy character to like and support, which is always a great thing for any series in any medium. Although still in the early phases of the new season, the show has still kept several things right: it’s funny, well animated, well voiced, and now and again, very touching. When Christmas is over and winter seems to be never-ending, it’s always a treat to have a warm-hearted series to snuggle down to watch – and the affecting tale of a lonely author and the abandoned cat he rescues (and who rescues him) is proving just that kind of feelgood tale. Subaru Mikazuki is a successful young author but leads a solitary life, due to his difficulties relating to other people, compounded by a tragic accident that has left him all alone in the world. When writer’s block strikes and his new editor is pestering him, he encounters an abandoned cat – and somehow the cat ends up in his house. (Food is the key!) Little by little, awkward Subaru learns how to care for the cat (whom he names Haru) and Haru settles in, becoming the inspiration for his new fiction. 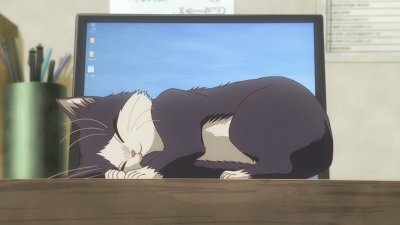 What’s especially endearing about this anime is the fact that half of each episode is narrated by Haru (Haruka Yamazaki delivers a lovely feline performance); the little cat’s point of view, by turns funny and touching, makes My Roommate is a Cat stand out, raising it above ‘yet another slice of life’. And Haru behaves like a real cat: she hisses at strangers, acts skittishly crazy from time to time, goes mad at food time and settles down on the keyboard of Subaru’s laptop when he’s trying to work because it’s warm (if you’ve ever tried to remove your pet cat from this position, as I have many, many times, you’ll definitely relate to this one). This really is a must-watch for cat lovers. 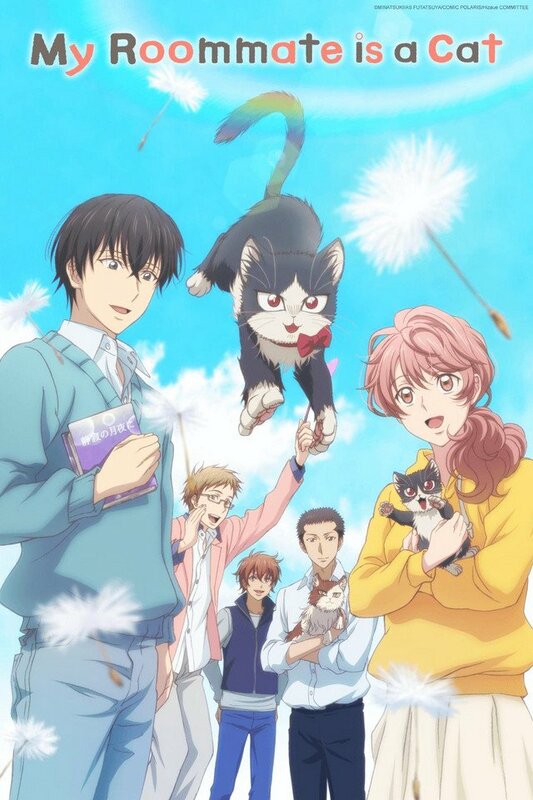 Based on the manga by Minatsuki with art by As Futatsuya, My Roommate is a Cat is streaming subbed on Crunchyroll and dubbed on Funimation. 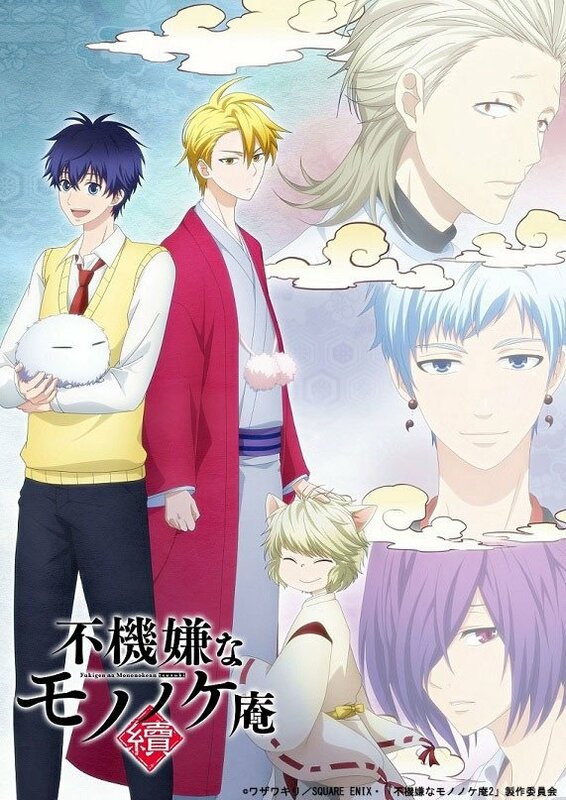 The Morose Mononokean II is streaming subbed on Crunchyroll and dubbed on Funimation.